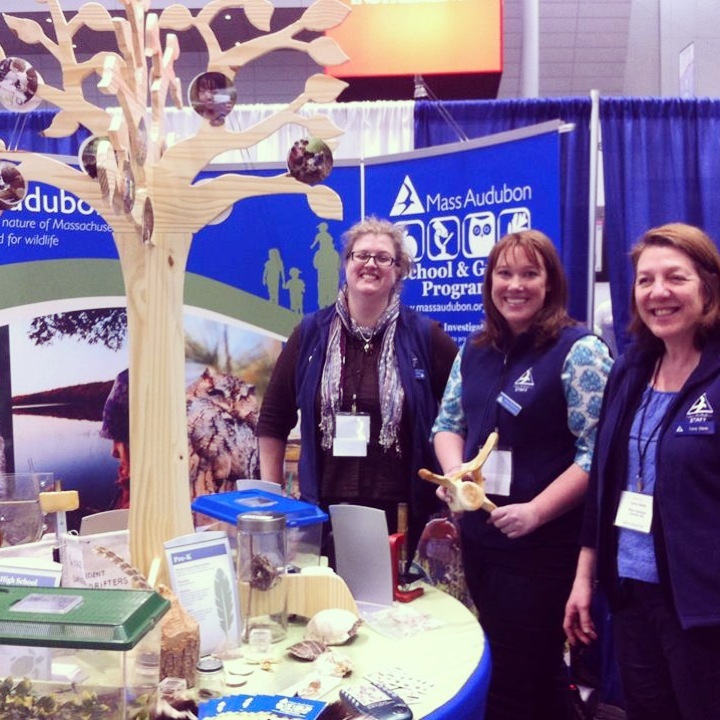 This is an exciting week for our educators, who, after a year of preparation, are representing Mass Audubon at the National Science Teacher Association (NSTA) Conference in Boston—an annual event that brings together 10,000 of the brightest minds in science education for four days of workshops, brainstorming, sharing best practices, and just plain geeking out. Now through Sunday we’ll be leading workshops on everything from how to engage students in STEM (Science, Technology, Engineering, and Math) through hands-on field research, to climate change science, to citizen science and other Mass Audubon School and Group topics. And we even have an interactive exhibit, complete with live animals and a tree! 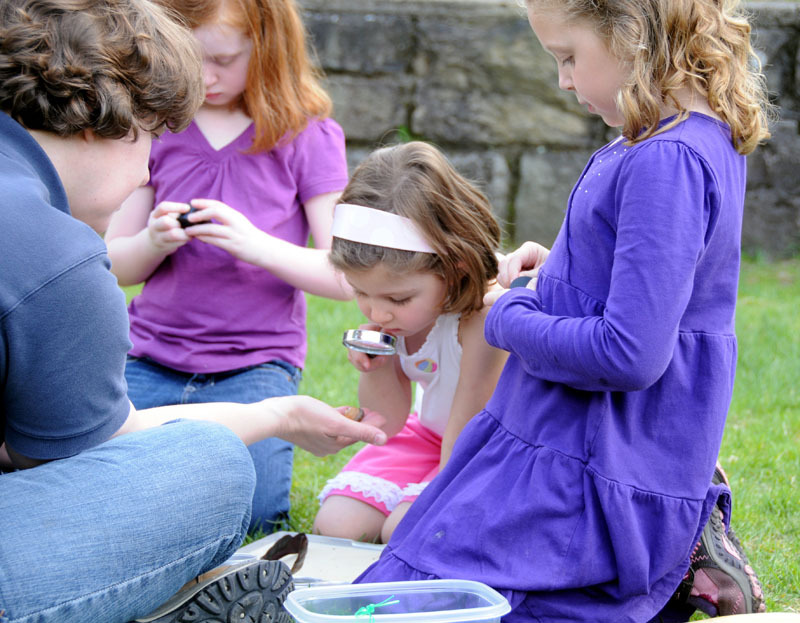 We excited to share our expertise, learn from other talented teachers, and spread the word about the role of environmental education in getting kids involved in science. If you happen to be at the conference be sure to stop by! We’ll be the ones with the sound of wood frogs coming from our booth. This entry was posted in General and tagged science, teachers on April 4, 2014 by Heather. Just like that, we’re officially in back-to-school season. And while for many, that means heading to the store to pick up notebooks, pencils, and pens, here we’re gathering our nets, binoculars, and field guides. Every year, our wildlife sanctuaries around the state work with local schools to get kids out of the classroom and into the fields to learn and explore nature. Just imagine: one day, you’re learning about dragonflies in a classroom, and the next you’re out in the meadows examining one up close. Not only does this interaction help the material sink in, but gives kids the confidence and knowledge they need to embrace rather than fear nature. We can’t tell you how many times a we’ve been told of a child who was petrified of snakes until they met one and learned about all of their fascinating traits. The best part: this learning is contagious. Kids bring home their newfound knowledge and share it with their parents, who then may take a closer look at that hawk flying overhead or frog croaking in the water next time their outside. To make the experience even more fulfilling our educators have developed programs that align with the Massachusetts Department of Education Curriculum Frameworks, and for many of our sites, the classes are customizable based on what a teacher is looking to accomplish. While we’ve been offering these programs for decades, this year, we’ve launched an Online School Program Catalog to make it even easier for parents and teachers to find out what classes are available and which curriculum frameworks they meet. If you’re a teacher, check it out and let us know what you think. Parents: Tell your teachers! Have questions? Ask in the comments! This entry was posted in EcoKids, Wildlife Sanctuaries and tagged kids, school, teachers on August 13, 2012 by Mass Audubon.